SEOUL, Nov. 16 (Yonhap) — South Korean hip-hop icon Drunken Tiger’s new song featuring BTS leader RM debuted at No. 1 on the U.S. iTunes’ hip-hop chart, its agency said Friday. “Timeless” from Drunken Tiger’s 10th full-length album topped the hip-hop/rap songs chart, the K-pop chart and the music video chart of the U.S. iTunes upon its release, according to Feel Ghood Music. The piece also ranked high on the main pop chart while topping iTunes’ song charts of 26 countries, including Sweden, Egypt, Romania, Israel, Finland, Saudi Arabia, Poland, the Philippines and Peru. 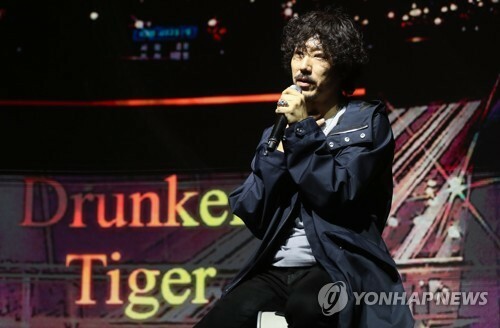 Released on Wednesday, the album “Drunken Tiger X: Rebirth of Tiger JK” that contains 30 tracks on two CDs featuring over a dozen prominent K-pop artists, including BTS’ RM, Seventeen’s Vernon, rapper Dok2 and SechsKies’ Eun Ji-won. “I want to leave good memories for my fans with this album and now I feel good because I’ve started my activities for the album with the good news,” Tiger JK said through the agency.